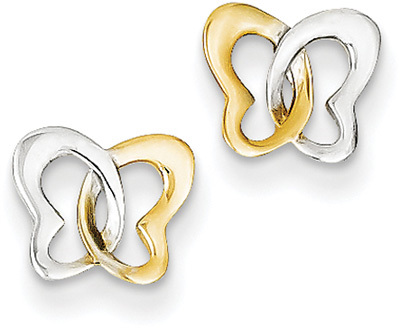 Two hearts come together in the shape of a butterfly to create these unique, polished butterfly heart stud earrings. Each butterfly measures approx. 5/16" in size. Pair this item with more beautiful jewelry from our butterfly jewelry collection! We guarantee our Butterfly Heart Stud Earrings, 14K Two-Tone Gold to be high quality, authentic jewelry, as described above.